The Bellavita Bathtub bath lift is an aged care equipment introduced to the market in October 2018 by Independent Living Specialist and now available in all their stores Australia wide. This mobility aid provides immense assistance to the elderly to get back their freedom and privacy in the bathroom. Manufactured in Germany, this aged care equipment weighs only 9.3 kg and considered to be the lightest bath lift in the market. It is also the lowest bath lift available. Other features include easy dismantling, installing and operating, a backrest that reclines 50 degrees, user-friendly charger, built in safety controls, 4 quick release suckers with options for an additional 2 for anti-slip bath base. It is capable of holding a maximum capacity of 140kg with a lifetime guarantee on frame and motor and 2 years guarantee on battery/handset. A Bellavita bathtub aid is able to improve symptoms of people ailing with neuromuscular or autoimmune diseases. Those with Parkinson disease to multiple sclerosis and arthritis experiencing limited mobility or balance issues could improve blood circulation and soothe their sore muscles. Users of bath lifts have found their energy level increased as they don’t have to strain themselves physically. The use of this aged care equipment gives an opportunity to those facing medical limitations gain back a luxury that was a thing of the past which they thought would never be experienced again. It is easy to use, cost-effective, safe and secure for a person with limited mobility. It is quite beneficial for the caregiver too. It could reduce the physical exertion of the caregiver. A caregiver could probably suffer a back strain whilst lifting the patient in and out of the bathtub and this aged care equipment saves the caregiver from such travails. Its side flaps aid in sliding the user from the edge of the bathtub into the bath seat. In addition, the hand control automates the movements of lowering and raising the user in and out of the bathtub. In other words, the Bellavita bathtub aid does the heavy lifting. This senior care equipment is not complicating to use and every feature has been specially designed keeping the elders and immobile users in mind. Its numerous safety features reduce the stress of taking a bath and also lessen the dependency on a caregiver. Improved independence from this bathing system provides manageable home care letting the user live in his or her own home without opting to live in a care facility. This mobility aid is also helpful to those with limited mobility and balance issues in regaining independence while bathing. Many users with specific conditions who have not been able to use a bathtub for many years has disclosed that this equipment has provided them with a therapeutic retreat that helped them physically and psychologically. Further, no matter what the medical condition indicates, the Bellavita bath lift will provide an enjoyable bathing experience. The fact of getting back freedom, happiness, and normalcy with the usage of this device is much more valuable than the cost incurred. Independent Living Specialists has always been at the forefront when it comes to assisting the elderly and disabled people to live a normal and happy life. They have now introduced a new bathtub lift to their existing range of bath aids. What is a Bath Lift? A bath lift is a seat which could be fitted into the bath and should be in level with the top of the bath when it is lifted to an upright position. This is mainly to assure that the user taking a bath can safely sit on the bath lift. Thereafter, move the feet and legs into the bath filled with water and lower the seat into the bath to relax in the freedom of having a bath on your own. This is a modern product from Drive Medical. It is the lightest bath lift chair available in the market manufactured with aluminum and could be assembled without any tools. It’s manufactured in two pieces for easy assembling and disassembling during transportation. The back could be folded for space saving storage when not in use. The backrest could be reclined to 50-degrees at its lowest position and the padded seat and backrest give added comfort. The watertight hand control is floatable, equipped with quick charge lithium battery included in the hand control. However, the suction cups are usable only on a smooth surface. This is a product of AusMedic and manufactured specially for those who need to get in and out of the bathtub easily. It comes in two parts for easy assembling, disassembling and transportation. Maximum safety and comfort are guaranteed due to the high-quality material used in the manufacture with servicing not being a requirement. Gaining self-independence and convenience are the main benefits of having a bath lift installed in a home. Since it could be easily operated with a remote, the user could be moved in and out of the bath easily by a caregiver or individual. In addition to the comfortable seat, the main feature for safety is that if the power is inadequate, the lift will not start to move the person inside it. Investing in bath lifts are cost effective. The attachment of this device directly on to the bath eradicates the requirement of installing expensive bathroom aids. Further, due to the belt being reversible, it could be used for a regular bath by others too. 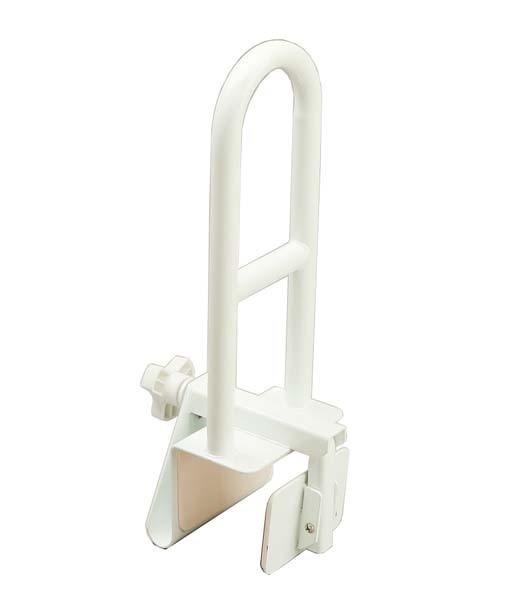 Safety is guaranteed as it securely and smoothly lowers the user in an out of the bathtub. Some models are attached with a non-slip transfer seat to ensure extra safety. The feeling of soaking oneself in a tranquilizing bath to enjoy the full intensity of bathing cannot be fathomed. Generally, a walk in the bathtub may probably make you feel uncomfortable and cold as you have to sit and wait until the water has drained out, However, in a bath lift a user can lie back and soak in a warm bath and get out at leisure. These products and other aged care equipment are available at all ILS stores Australia wide and at our online store. Visit www.ilsau.com.au for special deals. Maintaining a person’s independence and privacy in the confinement of the bathroom is the most important fact of an elderly or disabled person and the availability of bath and shower aids have proven to be an important aspect of their lives. The type of bath aid that will suit a person depends on the nature of the disability or age. Independent Living Specialist caters for many people with their large selection of bath and shower aids to meet anyone’s requirement. The equipment varies from simple grab rails to shower chairs and some priced below $500 to meet the budget of the customer. These products have been carefully selected from highly reputed brands for user’s comfort, safety and durability. Myco Swivel Bath Seat, Royale portable shower tray, Premium Bariatric shower chair and heavy-duty transfer bench are some of the bath aids priced below $500 for customer’s benefit. This product is priced at $445.99 enabling easy transition from standing to a bathing position. The seat is lockable while being transferred or bathing and the holes in the moulded plastic seat drain the water away from the seated area and the frame is kept firmly in position with the non-slip rubber feet. It is available mild or stainless steel completed in a powder coated finish. This vinyl coated shower tray is priced at $349.99, making showering very easy and safe. It could be placed on top of an existing drain hole or over an open drain hole by connecting the hose to the side of the passage. It can also be used with a standing shower chair for those who are immobile. The device is foldable easily into a carry bag, permitting quick storage and trouble-free portability. Instructions are printed on the carry bag and hose is included with the product. Priced at $349.99, this chair has been manufactured with aluminium pinched tubing. It is heavy duty and low maintenance bath aid. The modern “S” bend design gives extra space for the user to fit in between the armrest. The very light aluminium frame is also fitted with rubber suction tips for more strength and safety and is capable of safely accommodating a person up to 280kg. The seat is perforated for drainage and finished with a thicker durable powder coat to prevent being scratched. This device is priced at $299.99 and equipped with a structured, comfortably moulded backrest and the surface of the seat is anti-slip with holes for water drainage. It is manufactured with an aluminium frame including an adjustable height with ½’ increments. The backrest of the bench could be adjusted easily and the side arm/seat handles give extra support in transition. This equipment helps people who find it difficult to step over bathtub walls. The backrest and armrest are equipped with detent knobs and stainless steel spring pins for easy assembling. All products and other aged care equipment are available at ILS stores Australia wide and delivered free for online customers. Mobility bath aids play a great role when it comes to assisting the elderly and those with limited mobility to hold on to their independence and privacy in the bathroom. Various equipment has been invented to suit different people according to their requirement. Independent Living Specialists has a great range of bath aids appropriate for any type of disability. All the products have been sourced from well-known brands such as Care Quip, Ausmedic, Sunrise Medical, K Care and many others especially chosen to keep the user’s comfort, safety and durability in mind. The main concern when there is an elderly or immobile person around the house is when the bathroom floor is slippery when wet and it poses a threat to the users. With the introduction of many bath aids, the risks of injury or falls could be avoided to a great extent. This product gives the strength to hold on to when entering or exiting the bath area. It also gives additional support if you are in the shower and need some support to move. A shower chair is ideal for a person who prefers to sit while showering. A product with non-slip rubber feet is the best as it is safe and also protects the bath area from scratches and dents. The legs of the most shower chairs are adjustable and fit into most bathtubs. Bath Board, Bath Chair, Bath Rail-Tub Mount, Deltis Standard Bath Life and Cosby Bath Board are some of the fast-moving bath aids available in all stores of Independent Living Specialists Australia wide. The bath seat is one of the most frequently used mobility aids and it is known to increase the safety and security of the user at the time of having a bath. It also provides many health benefits pertaining to alleviating sprained and sore muscles, and easing stress. This chair has suction-cup legs which secure the chair in the bath area. Manufactured with a strong aluminium frame to prevent rusting and fixed additional strength. This bath rail is a steel powder coated product and fastens directly on to the side of most bathtubs and adjustable too. Users up to 100kg could use this and it helps a person to get in and out of the bath. This is a product that makes getting in and out of the bath easy. It comes in two separate parts for easy installation, dismantling and transporting. The best quality parts used in its manufacture guarantee the maximum safety and comfort without any servicing required. This is another product that contributes towards a secure seating area for bathing and showering. The shapely guided exterior drains water away from the seating area. This bath board has 4 adjustable feet to suit most baths and moulded plastic used in the manufacture supports its comfort and durability. Above products are delivered free for online customers. A person going through a disability issue such as loss of mobility due to advancing age does not need to feel uncomfortable or lose independence. A variety of aged care equipment for the home, hospital or aged care facility is now available within your budget. Independent Living Specialists has the perfect aged care aids and equipment to suit your lifestyle and enable to continue living life to the fullest satisfaction. Walking aids, bath aids and scooters are some of the aids and equipment suitable for the ageing population. A person who needs the lowest support to maintain balancing, a simple and strong walking cane could be the best idea, whilst, a person who needs extra support to walk can opt for walker frame or a seat walker. Most walkers are equipped with seats and popular with many as the user is able to walk, stop and rest safely and independently. All walkers and rollators have been selected carefully from many well-known manufacturers famous for their distinct features and advantages. There are more than 100 bath aids at ILS stores from over 15 branded manufacturers. These bath and shower aids are of immense help to the elderly in maintaining their independence and privacy in the bathroom. Especially hand-picked for the comfort and safety of the user from well-known brands, whether it is a handhold in the bathroom or a considerably greater level of support, the wide range of bath and shower aids at Independent Living Specialists will meet your requirement satisfactorily. Independent Living Specialists has over 40 branded mobility scooters in their stores Australia wide ranging from top sellers to special offers. Although this type of equipment is referred in various names, it all refers to the same device. Mobility scooters are most often mentioned as aged care scooters, but age is no barrier in this case as people of all ages are able to get their independence and freedom by using these battery powered equipment. Once again whether it is a battery powered aged care scooter, electric mobility scooter or electric powered scooter, it all refers to a battery-powered mobility scooter that is immensely popular in the community. The Envoy series, brings an outstanding addition to the Drive range of mobility scooters, with a brilliant performance similar to much bigger models. Independent Living Specialists is able to tailor a model to suit all requirements immaterial of its size, space, strength, indoor, outdoor, neighborhood or long distances. Pride and Shopriders scooters are the popular and most preferred brands due to their durability and availability of spares and each brand has a large range of models to suit the personal needs of the customer. ILS also offers scooters on hire/rent or buy purchase and whether it is bought outright, hire or rent, ILS will be with the customer on every mile of the way with the best prices, trustworthy aid and free roadside assistance for the first 12 months.